The Dynamic Server List monitor is a Global Monitor that runs outside of any server. It periodically checks servers to see which ones belong in a list determined by your criteria. You can receive alerts when servers enter and/or leave the list. Each of the rules available gather information from different places and have specific behaviors, which will be documented below. This is a setting that is applied to Servers/Devices when they are first created. It can be updated via the Bulk Config operation Computers: Set/Reset Block From Auto Configuration. This rule will return all computer that are in the specified group, or within a sub-group of the specified group. This rule is a string search, that will check the names of monitors within a server/device, and if the name search matches, the server/device is added to the list. Checks the server for all monitors it contains and if any are of the specified monitor type, the server is added to the list. Custom Properties on the server/device are checked for a match. Note that Customer Properties are inherited from groups 'above' the server/device in the group hierarchy, so Custom Properties set directly on the server/device as well as inherited properties are checked. Checks the database for a list of Processes on servers/devices that were monitored by a Process Monitor. Checks the database for any services that were monitored by a Service Monitor on the target server. Removing a Service Monitor from a server does not automatically remove the database entries for that server. This is a powerful way to make Dynamic Groups based on the software installed on a server. This will check values collected and stored in the database by the Inventory Collection monitor. Things such as Anti-Virus product, IP Address, OS version, installed CPU and memory, etc can be queried. Note that not all inventory fields are found/collected for all devices. This works on the property that can be set on servers/devices via Type & Credentials > Set Computer/Device Type in the Console. This can also be set by the Bulk Config operation Computers: Set Credentials (Windows, SNMP, ESX, IPMI). This allows you to create a list of devices that are monitored by the Central Monitoring Service, or by particular Satellites. This can be useful for creating lists of servers owned by a particular customer or in a specific geography if your other groups are arranged this way. This property is true for servers where the Central Monitoring Service or a Satellite Monitoring Service is installed and running. This rule reads a particular registry value and compares it to the criteria you set. If the criteria match, the server is added to the list. The name (including any alias that is set) is compared to the given rule to determine servers/devices that match. Statistics from most monitor types can be targeted with this rule. Once a specific statistic is chosen, values from that statistic are checked, and servers for which the statistic meets the checks are added to the list. Once you've defined a server list and how often it should update, you can use it further by defining a Dynamic Group. 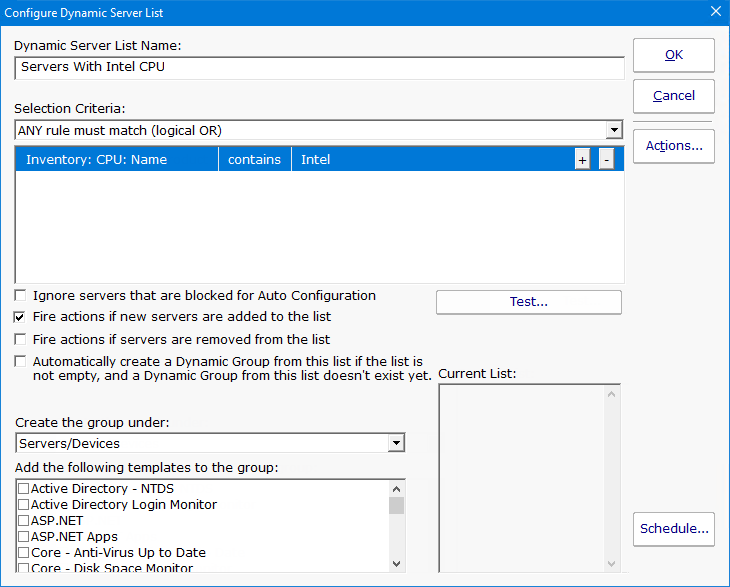 The Dynamic Group is defined by choosing an existing Dynamic Server List. Any server/device that shows up in the Dynamic Server List will belong to the group. Like all monitors, this monitor has standard buttons on the right for Adding Actions and setting the Monitor Schedule.